Our textile labels with fold are the professional way to label textiles with your own logo or motif. The attachment options are numerous, and the visual impression made by the textile labels is always perfect. All versions are available as of 500 items, in variable sizes and with up to 6 colors. All of our labels are guaranteed free from hazardous substances. Since we calculate the number and colors of the threads using the colors of your template, your template should contain a maximum of 6 colors. Many image files contain hundreds of colors along the edges which creates a softer image on the screen (anti-aliasing). This effect may cause a worse result with our Flexinera. Since JPG files generally contain anti-aliasing, we recommend not using this file type if at all possible. Our Flexinera®threads have been manually assigned the appropriate Pantone values by specially trained employees at a color temperature between around 5500°K (Kelvin) and 7500°K. The threads, which have no Pantone names, are our own colors. The RGB values that we use to visualize the selected threads and the preview image have been read from our Flexinara®threads at 6500°K using an optical spectrometer and manually optimized. Please note that the representation on your monitor will depend heavily on the monitor configuration you are using. In the woven label it is possible that threads next to or behind one another may influence the color representation. For a white label with a red logo, the red thread is located behind the white thread and will lend a light pink touch to the background. You can upload your own images. 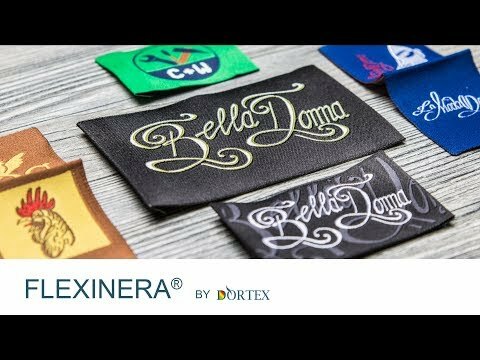 Flexinera textile labels with end fold on the left and right are particularly suitable for attaching inside a garment, for example, at the neckline. Just a few stitches by hand attaches the professional handmade label to hand-knitted or crochet items. Do you want to attach your textile label in portrait format or wrap it around a hem? No problem with our Flexinera textile labels with end fold at top and bottom. This version is perfect for finishing hats. Textile labels with a center fold are ideal for incorporation into external seams of clothing, at the side, at the waistband or collar. This looks both subtle and professional at the same time. You can choose different positions for your desired text and/or logo. Does a vertical format better suit your product or the design of your label? No problem! In line with your design, you can choose between various different positions for your desired text and/or logo. Fulfill the textile labeling obligations? That's easy with our professional care labels. Simply select, configure and order the desired quality and quantity. Small size, great benefits: Our woven size labels also available in various ranges. Extremely practical! Smart and reusable: Hangtags in various shapes and materials for hanging on.